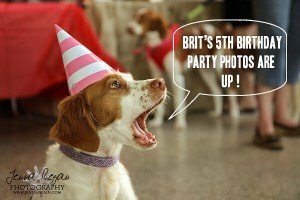 BRIT’s 5th Birthday Party Photos are up! The photos from BRIT’s 5th Birthday party are ready to view! These photos are candid, photo journalistic style, and taken by professional pet photographer, Jenna Regan. Her focus was to capture a variety of shots from the day and show the relationships and interactions…and they are so STINKIN’ CUTE!!! Orders can be placed directly from Jenna’s gallery for 4.6s, 5.7s, and 8.10s. Note: the photos you purchase will not have her watermark.